This was my first bike, with which I drove more then 20,000 km in 2 years. The 49 cc with 3 hp and a official maximum speed of 40 km/h (25 miles/h) weren't really much (most of my friends drove 80 cc), but it was the first feeling of "freedom". I had the motorcycle license (already for 10 years! ), but still no bike, and my buddy Guido had a motorcycle and no time to ride it. So I sometimes got to borrow his XT350 for a weekend. Therefore it is clearly Guido's fault that I became infected with the motorcycle-virus. But still, thank you Guido! 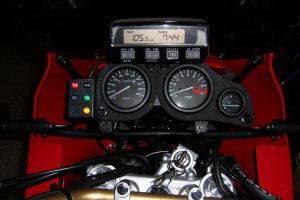 I bought my Honda NX650 Dominator in April 1999, and the speedometer then showed only 2,500 km (1,560 miles), even though the bike was already 6 years old. 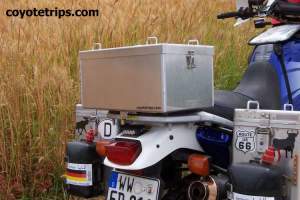 In June 2006, after my Adriatic Sea Trip, the speedometer then showed more than 109,000 km (68,125 miles)! - highway foot rests (self made); I fixed extra foot rests to the crash bars. They allow to drive relaxed on long distances. - hazard lights (self made); I simply connected a wire between the right and the left indicator and put a switch between -- simple, and it worked just fine! After the South Norway Trip the piston was worn out, and I had to replace it. Then on my USA Trip the engine overheated while I was stuck in a Las Vegas traffic jam. The cylinder head cracked and I had to get a new one; an additional oil cooler might have helped to avoid this problem. But until then I had only to replace some normal expendable parts, even though I didn't replace the engine oil as often as Honda directs! Honda wants me to replace the oil every 3,000 km (1,875 miles) -- shall I replace the oil twice on a vacation trip??? Sometimes, like in Iceland, one is even glad to get just gas in the middle of nowhere! In June 2006 I finally made the hard decision to sell the Domi, since I want to do more trips together with my wife Jayne. The good old Dominator is just a little too small for two people and luggage for two people. Part of me wanted to keep the bike, even though I was going to buy a new one, but I don't have space for a second motorcycle, and I believe a motorcycle should be ridden, not stored away. Also, I can't ride two at the same time. Even though there where lots of Domis on Ebay and Mobile that had way less kilometers and weren't much more expensive than mine, I sold mine within 12 hours!!! Obviously depreciation is not a problem at all! 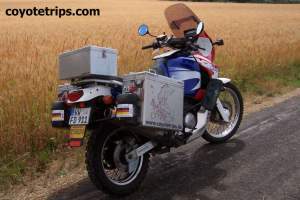 I bought the motorcycle for DM 6,250 with 2,481 km, and sold it seven years later for Euro 950 with 109,338 km. That is only Euro 0,02 per km or Euro 320,- per year! Honda XRV750 Africa Twin RD07 A, 2006 until ? In January 2006 I decided to buy a new (used) motorcycle. 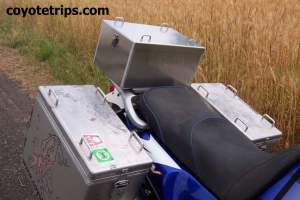 Since I want to do more often long trips together with Jayne, it was immediately clear that it had to be a Africa Twin. It was designed for long distance trips and gets best grades in every test. I didn't need to look for long until I found the right bike: first licensed in 2000 and only 5,600 km (3,500 miles). Because of high risk of getting the motorcycle stolen, I decided to do my Adriatic Sea Trip with the good old Dominator. It turned out to be the right decision, because the original tires of the Africa Twin are more street tires, and the roads in Albania are often extremely bad. The handling between the two bikes is quite different too, and I first need to get used to the Africa Twin before I go on a long trip. Now (Mar. 2015) I have ridden more than 95,000 km (60,000 miles), and am absolutely pleased! 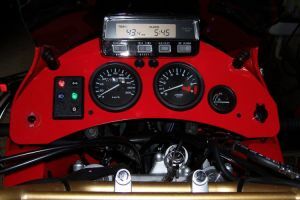 The topcase and the dashboard are available in my online shop.